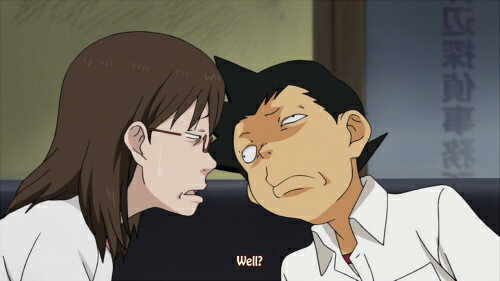 Akutabe has taken in a young boy whose grandfather (and presumed only guardian judging by the circumstances) has just died. 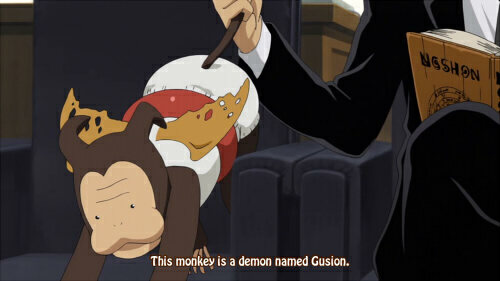 This boy is somehow in possession of another demon, a monkey-like one named Gusion who eats memories. Gusion apparently ate the boy’s memories of his grandfather in exchange for the contract. 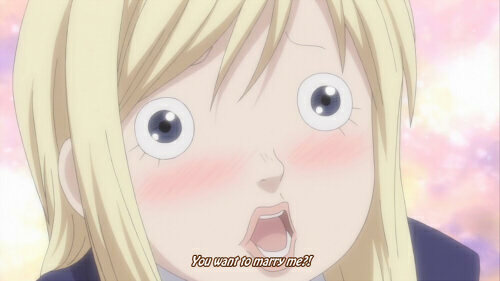 Rinko is ordered to enrol the boy in a school as his guardian, however she hates the kid and doesn’t want to so Akutabe is actually kind enough to order Undine (the mermaid) to do it instead. (why the boy has to be enrolled at school I have no idea but anyway) At the school, Undine falls in love with a teacher named Himoi with a strange idea of beauty. And here I though this kid was going to be normal. 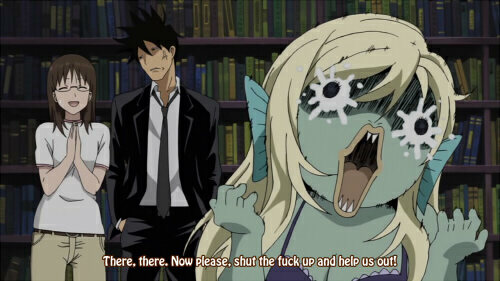 WOAHWOAH wait just one second Undine is -pretty- in the demon world? I’ve been saying in nearly every episode lately that this show is barely even about Azazel anymore, which is puzzling, and in this episode he was in it for maybe 15 seconds. 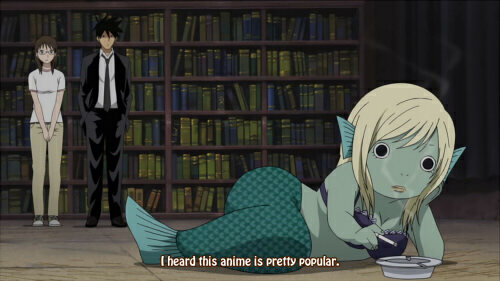 However, Rinko also took a back seat and the star of the episode was actually Undine. 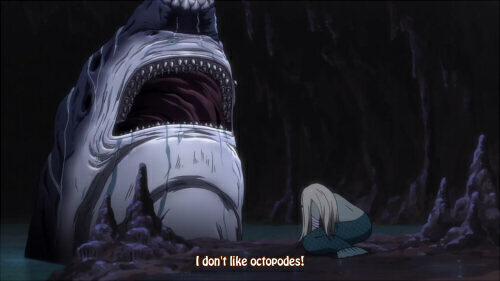 This I don’t mind at all, because I quite like Undine, annoying as she is. Her one-sided, abusive ‘relationship’ with Akutabe was verging on slightly uncomfortable lately so it’s good to see she’s had a change of heart, even if it seems to be with a bit of an oddball. (Well, I do look forward to learning more about this Himoi and the effect he seems to have on females judging by the next episode preview, anyway). Gusion could also potentially be an interesting character with the whole memory-eating thing so I hope this arc doesn’t disappoint. It’s off to a good start anyway, and I found it a lot more entertaining than the episodes have been lately, although it’s still not on par with the start of the series. I did find it pretty interesting that Undine looks noticeably different in the demon world, pretty, even, (although her face was obscured) so now I can’t help but wonder if this is her real form and the demons just look goofy in the human world. 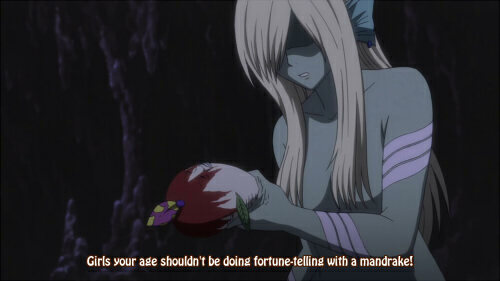 …In which case, what on earth does Azazel look like…? Don't care if it's inaccurate, this sub made me lol. 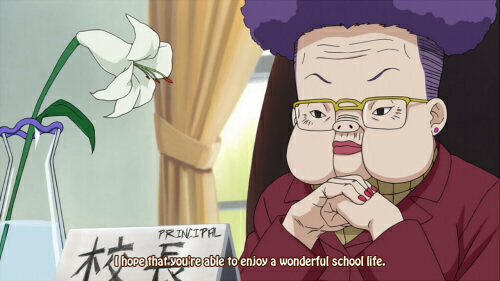 ...I used to know a teacher that looked just like this, no joke.